Babies Like to Live Dangerously. Those daredevils are always on the edge!! 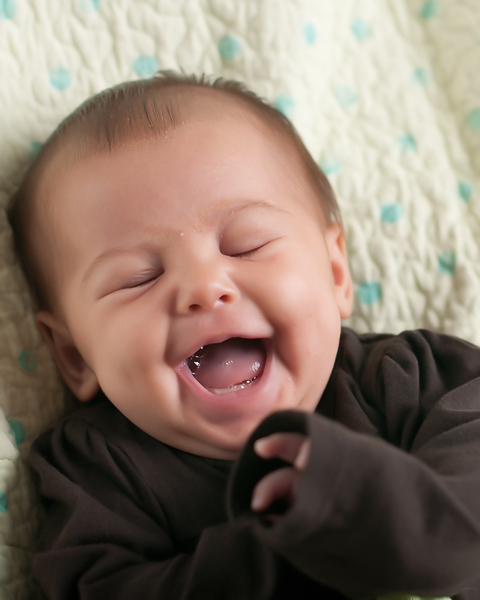 | Do Try This at Home: Babies Like to Live Dangerously. Those daredevils are always on the edge!! Babies Like to Live Dangerously. Those daredevils are always on the edge!! Colic seems to be abating a little around here. Part of this poor kid's problem is that she wants to do everything they don't let babies do anymore. She wants very badly to sleep on her stomach (SIDS risk). 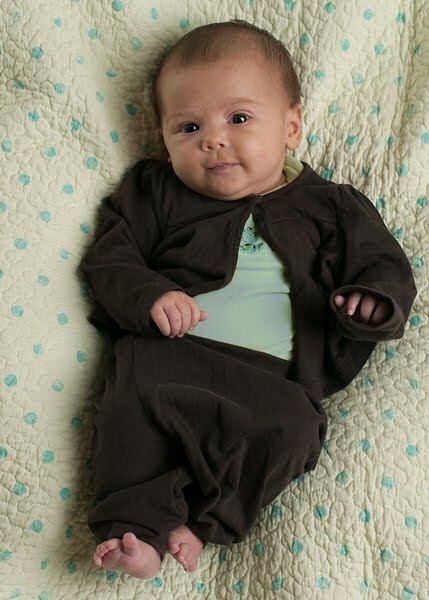 She wants to be extra bundled and warm (more SIDS risk), and she wants to use her baby products inappropriately. For example, she loves to sit on a this baby pillow on the bed and watch the ceiling fan. 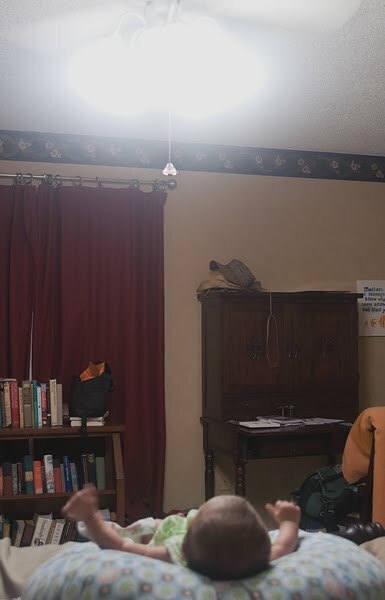 She smiles at the ceiling fan. She talks to the ceiling fan. My dad says she speaks fan-ese. The-Guy says she's a fan fan. Unfortunately, she's taking a deathly risk with this seemingly innocuous activity. 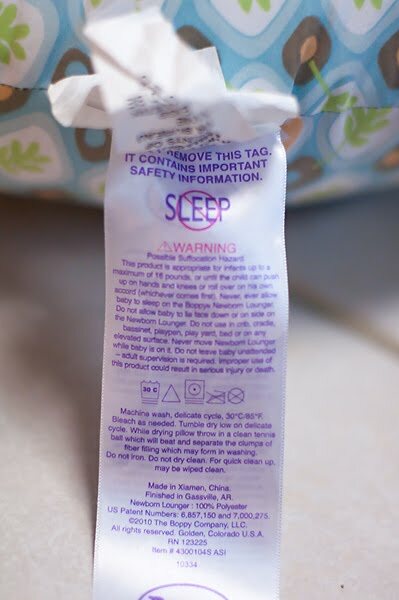 Here's a picture of the pillow with the warning label on the front. Other warning labels hang off the back. It's a VERY VERY dangerous product! 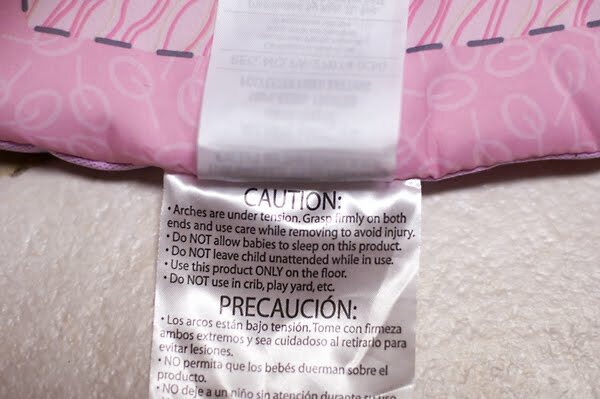 And one of the warnings clearly says, "Do not use in crib, cradle, bassinet, playpen, play yard, bed, or on any elevated surface." ALL her products are equally likely to kill her. Apparently. 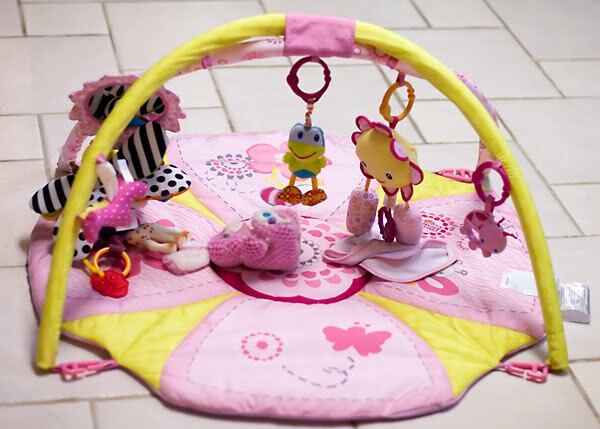 In fact, ALL her baby paraphernalia has umpteen warnings of your child's untimely demise. The labels should really just say, "Watch your kid you idiot! And don't blame us when tragedy strikes because we TOLD you this product was intended to knock off your baby!" So that's the story from around here. The colic is getting a little better and all her toys want to kill her off. She's getting more resigned to the fact though, and dare I say even happy now and again? It is sad the extent to which things have to be labeled - but after hot coffee/McDonalds, such is life. Your little girl is absolutely adorable. Don't you know you have to keep you child in a room with nothing in it so they can't hurt themselves. Its not like the good ol' days when you could give them a milk bone for teething, lol. Just so you know I never owned a dog so my girls didn't really get to enjoy these...lol. I told you fans are the bomb, you can eat out anywhere as long as they have fans, that is what we did if we wanted to go out to eat! have you tried the Baby Einstein DVDs? if she likes fans she will most likely enjoy these as well! glad she is calming down a bit! It's a money making extravaganza with mafia. EDSNATUR 108 is military and DASSAULT. He's running mob governments in UPPSALA - which is Utah pedophilia SA - LA. And they say " CHERR" is heavily involved in CHERSCO- SC. It's about " zoos " and ZOANDO. Organic farming is about organs and breeding experiments? One thing for sure . It's all about BILLY GUNN. It's all about " Wickramanayake". And that's apparently a guy in COCUK called Root. I remember the first time I used a dryer sheet with the kids' clothes. The book said not to do that because it reduces the flame resistance, but I really wanted to use a dryer sheet. Sure, I couldn't practice my torch-juggling around the baby anymore, but I guess that's the price we have to pay. She is so stinking CUTE!?!?! How can you do anything but just stare at her all day. So glad the colic is getting better. Funny Blogger Father! I don't use dryer sheets and actually Lielle doesn't have any fire resistant jammies either, so I guess I can continue my torch juggling! Glad to see a few colicky bubbles coming up there in that last photo. Better out than in I say!!! As for booby trapped baby products and watching your kid....can I stop now? I mean, she's 17. Can I please stop now????????? The UN is totally fucked with " FROGGY". That's not only Dana - Fredst but ROCUNROL. There goes YEMEN's " RICK's SETAIN ". 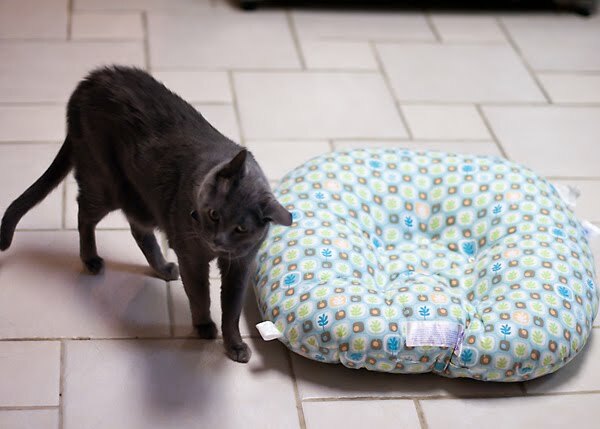 yeah, i guess putting the pillow on anything higher than 6 inches off the ground should be implicitly labelled. p.s. i'm wearing that same outfit right now! omg, she is so cute!!! Go look at blogger - Pics and Poems- Dave King . It's about OSIRIS and COSMOS RISA. Dwight is in black like the baby? Colorado 's informing and they speak of REDURAT 28. Bernard, Mark, Jeb, Ami, Raphy, Hilary, Ger, MP, Dana. Hilarious how a cute kid seen by everyone is at risk by the 0.0001% who get too much attention. You must look adorable Slyde! Thanks Kerry & Thanks Dr. Zibbs! John...I'm not sure I understand your comment, but I'm pretty sure you called my kid cute, so thank you!